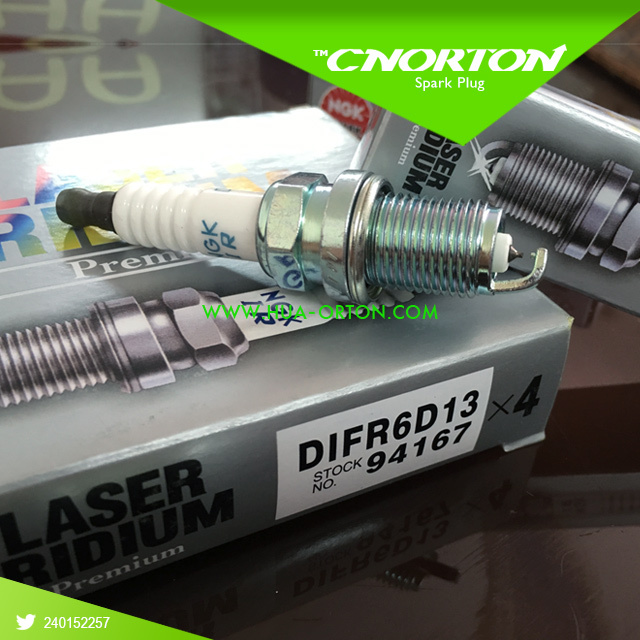 Genuine NGK Spark plug	Laser Iridium Range	Part Number: DIFR6D13	Stock No. 94167	Honda CR-Z	2011-2014 O.E.M. Recommended .6mm Electrode; Iridium-Platinum; Resistor	This part is compatible with 11 vehicle(s). WhatsApp: +8613818358982 . Fcebook: CN ORTON . Twitter: 240152257 . Website: www.hua-orton.com . Skype: HUA ORTON . VK: Id291814518 . We accept payment by Credit Card, Paypal , Bank Transfer and other Payment that Aliexpress support. Payment must be received within 19 days of auction closing Please list your special requests (color, packages, value of declaration, etc.) when you make payment, or send message to us. Shipping by China/HK post air mail is very slow,The average delivery time is about 40 days,But you have to wait 50-70days on shopping season and bad weather.If you cannt wait,Please dont choose this shipment term. SERVICE TRANSIT TIME is provided by the carrier and excludes weekends and holidays. Transit times may vary, particularly during the holiday season. If you have not received your shipment within 40 workdays from we send it out, please contact us. We will track the shipment and get back to you as soon as possible with a reply. Our goal is customer satisfaction! Due to stock status and time differences, we will choose to ship your item from our first available warehouse for fast delivery. you have 14 days to return it from the date it was received. Please contact us in the 14 days. If this item is in your possession more than 14 days, it is considered used and we will not issue you a refund or replacement. hope you can understand.All returned items must be in the original packaging and you must provide us with the shipping tracking number, your reason for the return, and your Aliexpress ID. We will refund you upon receipt of the item in its original condition and packaging with all components and accessories included. You also can choose to have a replacement. If you have some problem with the color, size, quality or other problem, please contact us freely before you give us a neutral/negative feedback. We will leave POSITIVE FEEDBACK as soon as the Aliexpress allow us to leave feedback. We warmly like to give you satisfy solution. If you love our item, warmly expected your five stars feedback. We will work harder to give you a satisfy service. Since your feedback is very important for us, we sincerely invite you to leave positive feedback for us,thank you very much. we will help you to choose the correct one in 12 hours!